Citation Information: J Clin Invest. 2004;114(9):1308-1316. https://doi.org/10.1172/JCI19603. Idiopathic pulmonary fibrosis is a progressive and fatal fibrotic disease of the lungs with unclear etiology. Prior efforts to treat idiopathic pulmonary fibrosis that focused on anti-inflammatory therapy have not proven to be effective. Recent insight suggests that the pathogenesis is mediated through foci of dysregulated fibroblasts driven by profibrotic cytokine signaling. TGF-β and PDGF are 2 of the most potent of these cytokines. In the current study, we investigated the role of TGF-β–induced fibrosis mediated by activation of the Abelson (Abl) tyrosine kinase. Our data indicate that fibroblasts respond to TGF-β by stimulating c-Abl kinase activity independently of Smad2/3 phosphorylation or PDGFR activation. Moreover, inhibition of c-Abl by imatinib prevented TGF-β–induced ECM gene expression, morphologic transformation, and cell proliferation independently of any effect on Smad signaling. Further, using a mouse model of bleomycin-induced pulmonary fibrosis, we found a significant inhibition of lung fibrosis by imatinib. Thus, Abl family members represent common targets for the modulation of profibrotic cytokine signaling. Citation Information: J Clin Invest. 2004;114(6):795-804. https://doi.org/10.1172/JCI20921. Many adult organs contain stem cells, which are pluripotent and are involved in organ maintenance and repair after injury. In situ, these cells often have a low cycling rate and locate in specialized regions (niches). To detect such cells in the kidney, we administered a pulse of the nucleotide bromodeoxyuridine (BrdU) to rat and mouse pups and, after a long (more than 2-month) chase, examined whether the kidney contained a population of low-cycling cells. We found that in the adult kidney, BrdU-retaining cells were very sparse except in the renal papilla, where they were numerous. During the repair phase of transient renal ischemia, these cells entered the cell cycle and the BrdU signal quickly disappeared from the papilla, despite the absence of apoptosis in this part of the kidney. In vitro isolation of renal papillary cells showed them to have a plastic phenotype that could be modulated by oxygen tension and that when injected into the renal cortex, they incorporated into the renal parenchyma. In addition, like other stem cells, papillary cells spontaneously formed spheres. Single-cell clones of these cells coexpressed mesenchymal and epithelial proteins and gave rise to myofibroblasts, cells expressing neuronal markers, and cells of uncharacterized phenotype. These data indicate that the renal papilla is a niche for adult kidney stem cells. Citation Information: J Clin Invest. 2004;114(5):634-642. https://doi.org/10.1172/JCI21851. Adenosine coordinates organ metabolism and blood supply, and it modulates immune responses. In the kidney it mediates the vascular response elicited by changes in NaCl concentration in the macula densa region of the nephron, thereby serving as an important regulator of GFR. To determine whether adenosine formation depends on extracellular nucleotide hydrolysis, we studied NaCl-dependent GFR regulation (tubuloglomerular feedback) in mice with targeted deletion of ecto-5′-nucleotidase/CD73 (e-5′NT/CD73), the enzyme responsible for adenosine formation from AMP. e-5′NT/CD73–/– mice were viable and showed no gross anatomical abnormalities. Blood pressure, blood and urine chemistry, and renal blood flow were not different between e-5′NT/CD73+/+ and e-5′NT/CD73–/– mice. e-5′NT/CD73–/– mice had a significantly reduced fall in stop flow pressure and superficial nephron glomerular filtration rate in response to a saturating increase of tubular perfusion flow. Furthermore, whereas tubuloglomerular feedback responses did not change significantly during prolonged loop of Henle perfusion in e-5′NT/CD73+/+ mice, a complete disappearance of the residual feedback response was noted in e-5′NT/CD73–/– mice over 10 minutes of perfusion. The contractile response of isolated afferent arterioles to adenosine was normal in e-5′NT/CD73–/– mice. We conclude that the generation of adenosine at the glomerular pole depends to a major extent on e-5′NT/CD73–mediated dephosphorylation of 5′-AMP, presumably generated from released ATP. Citation Information: J Clin Invest. 2004;114(5):643-651. https://doi.org/10.1172/JCI21004. In collapsing focal segmental glomerulosclerosis (FSGS) of HIV-associated nephropathy (HIVAN), podocytes exhibit a high proliferation rate and loss of differentiation markers. We have found previously that the nef gene of HIV-1 is responsible for these changes. Here, we investigated the signaling pathways induced by Nef and its role in the pathogenesis of HIVAN. Using conditionally immortalized podocytes after differentiation, we found that infection of podocytes with nef increased Src kinase activity and signal transducer and activator of transcription 3 (Stat3) phosphorylation and activated the Ras–c-Raf–MAPK1,2 pathway. A dominant negative mutant of Src abolished the Nef effect, whereas inhibition of MAPK1,2 or dominant negative Stat3 reduced Nef effects partially. Reducing the expression of Nef with small interference RNA reversed the Nef effect. Mutation of Nef in the PxxP or R105R106 motifs diminished Nef signaling and the phenotypic changes in podocytes. Both phospho-MAPK1,2 and phospho-Stat3 staining increased in podocytes of kidneys from HIV-1 transgenic mice compared with their littermates and in podocytes of kidneys from HIVAN patients compared with HIV patients with non-HIVAN kidney diseases or non-HIV patients with idiopathic FSGS, classic FSGS, or minimal-change disease. These data suggest that Nef-induced activation of Stat3 and Ras-MAPK1,2 via Src-dependent pathways is responsible for podocyte proliferation and dedifferentiation, a characteristic finding in collapsing FSGS of HIVAN. Citation Information: J Clin Invest. 2004;113(11):1560-1570. https://doi.org/10.1172/JCI20665. While macro- and microscopic kidney development appear to proceed normally in mice that lack Foxi1, electron microscopy reveals an altered ultrastructure of cells lining the distal nephron. Northern blot analyses, cRNA in situ hybridizations, and immunohistochemistry demonstrate a complete loss of expression of several anion transporters, proton pumps, and anion exchange proteins expressed by intercalated cells of the collecting ducts, many of which have been implicated in hereditary forms of distal renal tubular acidosis (dRTA). In Foxi1-null mutants the normal epithelium with its two major cell types — principal and intercalated cells — has been replaced by a single cell type positive for both principal and intercalated cell markers. To test the functional consequences of these alterations, Foxi1–/– mice were compared with WT littermates in their response to an acidic load. This revealed an inability to acidify the urine as well as a lowered systemic buffer capacity and overt acidosis in null mutants. Thus, Foxi1–/– mice seem to develop dRTA due to altered cellular composition of the distal nephron epithelium, thereby denying this epithelium the proper gene expression pattern needed for maintaining adequate acid-base homeostasis. Citation Information: J Clin Invest. 2004;113(10):1390-1397. https://doi.org/10.1172/JCI20402. 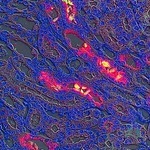 Kidney podocytes and their slit diaphragms form the final barrier to urinary protein loss. This explains why podocyte injury is typically associated with nephrotic syndrome. The present study uncovered an unanticipated novel role for costimulatory molecule B7-1 in podocytes as an inducible modifier of glomerular permselectivity. B7-1 in podocytes was found in genetic, drug-induced, immune-mediated, and bacterial toxin–induced experimental kidney diseases with nephrotic syndrome. The clinical significance of our results is underscored by the observation that podocyte expression of B7-1 correlated with the severity of human lupus nephritis. In vivo, exposure to low-dose LPS rapidly upregulates B7-1 in podocytes of WT and SCID mice, leading to nephrotic-range proteinuria. Mice lacking B7-1 are protected from LPS-induced nephrotic syndrome, suggesting a link between podocyte B7-1 expression and proteinuria. LPS signaling through toll-like receptor-4 reorganized the podocyte actin cytoskeleton in vitro, and activation of B7-1 in cultured podocytes led to reorganization of vital slit diaphragm proteins. In summary, upregulation of B7-1 in podocytes may contribute to the pathogenesis of proteinuria by disrupting the glomerular filter and provides a novel molecular target to tackle proteinuric kidney diseases. Our findings suggest a novel function for B7-1 in danger signaling by nonimmune cells. Citation Information: J Clin Invest. 2004;113(6):814-825. https://doi.org/10.1172/JCI20083. Hepatocyte nuclear factor–1β (HNF-1β) is a Pit-1, Oct-1/2, UNC-86 (POU)/homeodomain-containing transcription factor that regulates tissue-specific gene expression in the liver, kidney, and other organs. Humans with autosomal dominant mutations of HNF-1β develop maturity-onset diabetes of the young type 5 (MODY5) and congenital cystic abnormalities of the kidney. Autosomal recessive polycystic kidney disease (ARPKD) is an inherited cystic disorder that produces renal failure in infants and children and is caused by mutations of PKHD1. The proximal promoter of the mouse Pkhd1 gene contains an evolutionarily conserved HNF-1–binding site that is located near a region of deoxyribonuclease hypersensitivity. HNF-1β and the structurally related HNF-1α bind specifically to the Pkhd1 promoter and stimulate gene transcription. Mutations of the HNF-1 site or expression of a dominant-negative HNF-1β mutant inhibit Pkhd1 promoter activity in transfected cells. Transgenic mice expressing a dominant-negative HNF-1β mutant under the control of a kidney-specific promoter develop renal cysts, similarly to humans with MODY5. Pkhd1 transcripts are absent in the cells lining the cysts but are present in morphologically normal surrounding tubules. These studies identify a link between two cystic disease genes, HNF1β (MODY5) and PKHD1 (ARPKD). HNF-1β directly regulates the transcription of Pkhd1, and inhibition of PKHD1 gene expression may contribute to the formation of renal cysts in humans with MODY5. Citation Information: J Clin Invest. 2004;113(3):491-491. https://doi.org/10.1172/JCI17913C1. Citation Information: J Clin Invest. 2003;112(10):1486-1494. https://doi.org/10.1172/JCI19270. Tubulointerstitial fibrosis is the final common result of a variety of progressive injuries leading to chronic renal failure. Transforming growth factor-β (TGF-β) is reportedly upregulated in response to injurious stimuli such as unilateral ureteral obstruction (UUO), causing renal fibrosis associated with epithelial-mesenchymal transition (EMT) of the renal tubules and synthesis of extracellular matrix. We now show that mice lacking Smad3 (Smad3ex8/ex8), a key signaling intermediate downstream of the TGF-β receptors, are protected against tubulointerstitial fibrosis following UUO as evidenced by blocking of EMT and abrogation of monocyte influx and collagen accumulation. Culture of primary renal tubular epithelial cells from wild-type or Smad3-null mice confirms that the Smad3 pathway is essential for TGF-β1–induced EMT and autoinduction of TGF-β1. Moreover, mechanical stretch of the cultured epithelial cells, mimicking renal tubular distention due to accumulation of urine after UUO, induces EMT following Smad3-mediated upregulation of TGF-β1. Exogenous bone marrow monocytes accelerate EMT of the cultured epithelial cells and renal tubules in the obstructed kidney after UUO dependent on Smad3 signaling. Together the data demonstrate that the Smad3 pathway is central to the pathogenesis of interstitial fibrosis and suggest that inhibitors of this pathway may have clinical application in the treatment of obstructive nephropathy. Citation Information: J Clin Invest. 2003;112(6):843-852. https://doi.org/10.1172/JCI17647. The AP-1 transcription factor, composed of Jun and Fos proteins, plays a crucial role in the fine tuning of cell proliferation. We showed previously that AP-1 complexes are activated during the proliferative response that parallels the development of renal lesions after nephron reduction, but little is known about the specific role of individual Jun/Fos components in the deterioration process. Here we used JunD knockout (JunD–/–) mice and an experimental model of chronic renal injury (75% nephron reduction) to explore the role of JunD. Nephron reduction resulted in an initial compensatory growth phase that did not require JunD. JunD, however, was essential to inhibit a second wave of cell proliferation and to halt the development of severe glomerular sclerosis, tubular dilation, and interstitial fibrosis. We show that the effects of junD inactivation are not cell autonomous and involve upregulation of the paracrine mitogen, TGF-α. Expression of a transgene (REM) encoding a dominant negative isoform of the EGFR, the receptor for TGF-α, prevented the second wave of cell proliferation and the development of renal lesions in bitransgenic JunD–/–/REM mice. We propose that JunD is part of a regulatory network that controls proliferation to prevent pathological progression in chronic renal diseases.